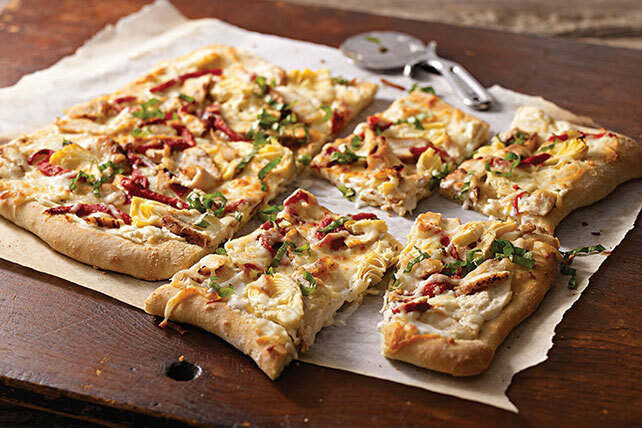 Mix reduced-fat cream cheese, milk and garlic powder until blended; spread onto pizza crust. Top with chicken, peppers, artichokes and cheeses. Bake 10 to 12 min. or until mozzarella is melted and edge of crust is golden brown. Top with basil. Substitute sliced roasted tomatoes or oil-packed sun-dried tomato strips for the roasted red pepper strips.